A slimmed down version of the other Blizzard products, designed to fit a Kit Bag, hydration sleeve, or plate carrier. Instead of the usual brick-like shape of a Blizzard Survival product, the EMS Blanket is vacuum-sealed in a wide, flat shape that fits where its counterparts will not. This version is ideal for Search and Rescue professionals, hunters, and anyone required to wear armor on the job. 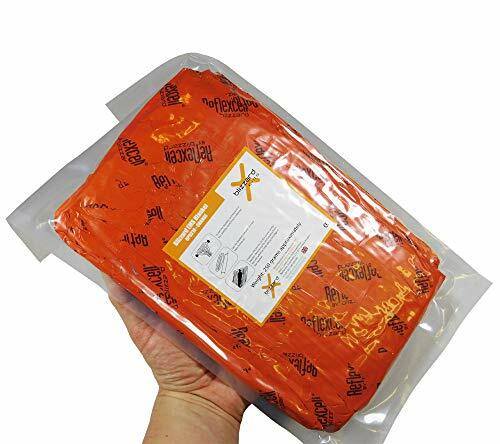 The Blizzard EMS Blanket uses a two-layer version of the Reflexcell Technology that substantially outperforms conventional space blankets. It also features self-adhesive closures that allow the blanket to be used as a sleeping bag, or to keep patients covered while on litters, stretchers, baskets, etc. Windproof, waterproof blanket that uses 2-layer Reflexcell Technology to insulate and protect. Metallized inner layer reflects body heat back toward user. The Blizzard EMS Blanket is an improved version of standard casualty blankets used by EMTs and paramedics. Self-adhesive closure retains warmth while allowing access; can be opened and reclosed as needed. High visibility orange outside to make user easily findable by search and rescue personnel and pilots. Slim profile fits plate carriers, hydration sleeves, or kit bags. Ideal for use by search and rescue and pararescue, MSAR, forest rangers, hunters, pilots, overlanders, foresters, surveyors, and other wilderness professionals to prevent the onset of hypothermia or shock in emergency situations. Vacuum-sealed with flat profile, making this the ideal emergency blanket for compact spaces like vehicle and aircraft survival kits, go-bags, and backpacks. Fits many plate carriers and hydration sleeves. Ideal for use with Skeds and Stokes Baskets. Size (vacuum packed): 4.7 in. x 4.3 in. x 1.9 in. ; Size (unpacked): 90.5 in. length x 77 in. width (fully stretched); Weight: 9 oz. Brand: Blizzard Protection Systems, Ltd. If you have any questions about this product by Blizzard Protection Systems, Ltd., contact us by completing and submitting the form below. If you are looking for a specif part number, please include it with your message.